The $750,000 1 1/8 Miles Woodward Stakes for three-year-olds and up headlines a big race day at Saratoga Race Course on Saturday, August 31, 2013. The 60th running of the Woodward Stakes is shaping up to be a Whitney Invitational rematch between Successful Dan, Mucho Macho Man, Ron The Greek, and Alpha, with two very interesting contenders added to the mix including Paynter and Flat Out. The always-optimistic trainer Charles LoPresti, of seven-year-old Successful Dan, is hoping his day will come on Saturday in the 2013 Woodward Stakes. After “spooking” and finishing 2nd in the Whitney Invitational, the gelding seems more than ready to take the field by storm. Successful Dan is owned by Morton Fink and will break with jockey Julien Leparoux from post #2 with 5/2 odds. Mucho Macho Man and Edgar Prado will break from post position #6 with 9/2 odds for trainer Kathy Ritvo. Mucho Macho Man is on everyone’s radar this week. The five-year-old Kathy Ritvo trained fan-favorite is determined to capture a GI win before the year is up. Mucho Macho Man finished 3rd in the Whitney Invitational behind Cross Traffic and Successful Dan. Reeves Thoroughbred Racing reported Mucho Macho Man is in the best shape of his career and is hoping for a shot at the Breeders’ Cup Classic again this year. MMM crossed the finish line 2nd behind Fort Larned in the 2012 Breeders’ Cup Classic. Jockey Edgar Prado will lead Mucho Macho Man across the Saratoga Race Track finish line from post #6 with 9/2 morning line odds. Ron The Greek has a shaky record this year that doesn’t seem to be improving. Despite the numbers, the six-year-old William Mott trained horse is a monster. 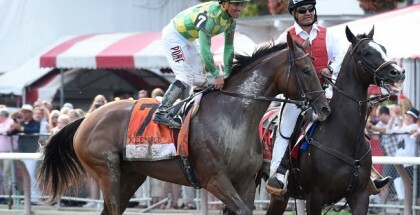 He finished fourth right behind Mucho Macho Man in the Whitney Invitational. There is something sneaky about Ron The Greek. If anyone upsets the small 2013 Woodward Stakes field, it will be Ron The Greek. Ron The Greek, with 8/1 odds, breaks from post position #1 with Javier Castellano in Saturday’s Woodward Stakes. Longshot bet Alpha, with 12/1 odds, finished sixth in the Whitney Invitational. The four-year-old colt hasn’t had much success this year but finished first in the 2012 Travers Stakes and the 2012 Jim Dandy Stakes. 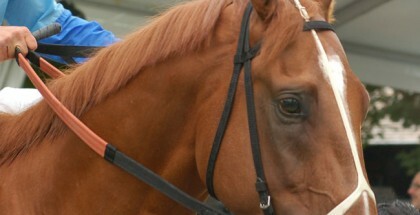 Alpha is owned by Godolphin Racing and trained by Kiaran McLaughlin. Powerhouse jockey John Velazquez teams up with Alpha who will break from post position #7 on Saturday. Paynter, with 2/1 odds, is the current favorite in the 2013 Woodward Stakes at Saratoga Race Course on Saturday, August 31st with Rafael Bejarano on the mount. 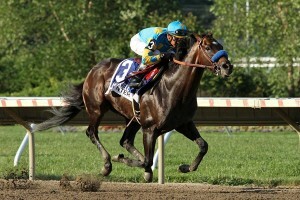 Paynter arrived at Newark airport on Wednesday safe and sound. Shortly after his $1 million Haskell win the four-year-old colt was fighting for his life just a year ago and will now take that fight to the Saratoga track in efforts to give his fans what they really want, a GI Woodward Stakes win against some of the toughest competition around! With 2/1 morning line odds, the Bob Baffert trained Zayat Stables owned miracle horse will break from post position #5 with Rafael Bejarano on the mount. 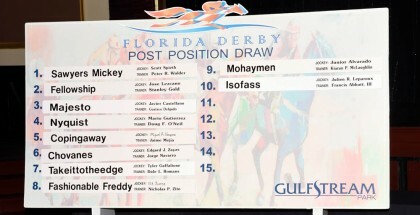 Flat Out is a seven-year-old Florida horse also trained by William Mott. Owned by Preston Stables, Flat Out finished first in five of his races this year including the Suburban Handicap on July 6th and the Westchester Stakes on April 27th. Jockey Junior Alvarado and Flat out with break from the 4th post position with 3/1 odds. In related news, Along with four-year-old Cross Traffic, Fort Larned will shoot for the Jockey Club Gold Cup at Belmont Park on September 28, 2013. The 2013 Breeders’ Cup Classic champion Fort Larned was sidelined from the Woodward Stakes after a muscle strain in his hind leg. Trainer Ian Wilkes reported he was “skipping the race” after Fort Larned was suspiciously acting out of character. The precaution is in the camp’s best interest as defending the five-year-old’s Breeders’ Cup Classic title is the main goal this year. Flat Out and jockey Junior Alvarado will break from post position #4 with 3/1 odds in the 2013 Woodward Stakes at Saratoga on Saturday. 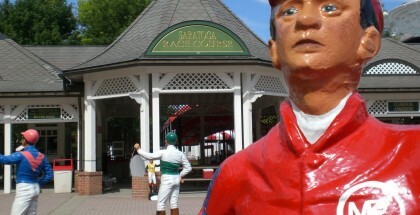 The Woodward Stakes takes place on the final Saturday for Saratoga Race Course that concludes the 2013 Spa season. Closing ceremonies at the Spa to celebrate the 150th anniversary are scheduled for Friday, August 30, 2013. Saratoga Race Course is also offering fans to join the fun with a two-day Family Fun Fest on Sunday, September 1st and Monday, September 2nd. Families and children can enjoy kid-friendly activities that will benefit the Ronald McDonald House Charities. The 2013 Woodward Stakes is the 10th race of the day with a 5:45 PM EDT post time. Trixie’s Pixies: Fort Larned was my original WIN pick but he’s been scratched. Like anyone else with a beating heart, I’d like to see Paynter beat the pants off the entire Woodward Stakes field for the sheer fact that he’s literally come back from the dead. 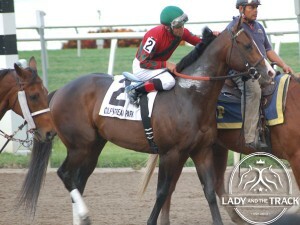 Paynter is undeniably the fans choice and has the talent to back up the hype! I’d like to see Mucho Macho Man get his much deserved victory and head to the Breeders’ Cup but I’m not sure he’s got what it takes. Mucho Macho Man is also a fan-favorite and like Paynter, has recovered from illness so a win would be heartfelt. Despite my heart, my gut is telling me Flat Out for the WIN! I feel like Flat Out is on a steady incline and he knows what’s expected of him. Good Luck! Safe Run! And remember Ladies…Never place a bet with your lover’s money. It’s simply bad luck!